After almost a month working with the children worst affected by the earthquake, which hit Central Java on 27 May 2006, providing school books, pens etc., activities, competitions and games, the Foundation turned its attention to the issue of reconstruction. It was generally understood that the Indonesian Government had the intention to provide compensation to those who lost their houses or suffered significant damage to their property from the earthquake. The amounts were to be 30 million rupiah ( approx. 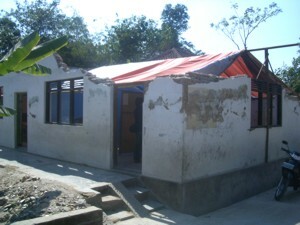 US$ 3,300 ) for a collapsed house, 20 million Rupiah ( approx. 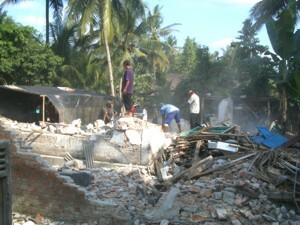 US$ 2,200 ) for a significantly damaged house and 10 million Rupiah ( approx. US$ 1,100 ) for a slightly damaged house. However only a small amount of this has been realised to date, one of the reasons being that the budget was initially made on a much lower number of damaged properties. 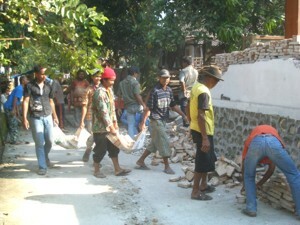 In the villages, community members have been helping each other to recover bricks, wooden beams and roof tiles from the piles of rubble that can be used in rebuilding. However they desperately need capital to buy cement, sand and steel. As it stands, those that can afford to buy these materials can only afford the absolute minimum. Those houses that are being rebuilt are being constructed without steel infrastructure and with such a poor mix of cement to sand that another earthquake, in this very earthquake prone are of the world, will easily collapse these houses causing much more death and injury. With over 600,000 houses destroyed or badly damaged, Yayasan Gunungan has neither the capital nor the infrastructure to be able to implement a full reconstruction program. However there are three areas in which the Foundation is able to help and is now focusing its attention. That is; Temporary Accommodation, School Rebuilding and Library Services. Hundreds of thousands of people are still homeless. They continue to live under plastic sheets and wait patiently for assistance. In just 2 months time the rains will start again, and if these people are still living under plastic sheets at this time, then it is almost certain that many will become sick and not survive. According to the Australian branch of Save the Children; "The lack of transitional shelter will have severe health consequences for vulnerable communities in the coming rainy season if the issue is not addressed." 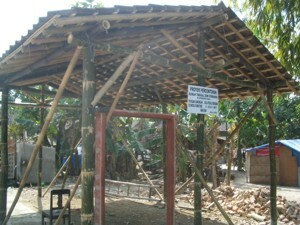 Yayasan Gunungan is working to provide temporary bamboo houses to as many people as possible before the rains begin again. The cost of one house 4m x 6m, is 900,000 Rupiah ( approx. US$ 100 ). That is the cost of the bamboo, woven bamboo walls and other materials. Old tiles saved from the fallen houses are used for the roof. The Foundation is being assisted by volunteers from Gaja Mada University, Solo Peduli Bersama and the local community, who are performing the building work at no charge. One of these bamboo houses can shelter a large family, keeping them safe from the rains, while they wait until such time that their houses can be rebuilt. Once the rains begin again, the fields will become mud baths and the temporary school tents set-up in these places will not provide any protection. The schools need to be rebuilt and repaired as soon as possible. There are hundreds of such schools across the area. Some in worse conditions than others. 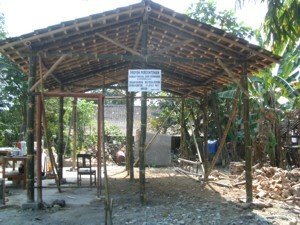 It is estimated that to rebuild an average sized school will take approximately US$ 15,000. 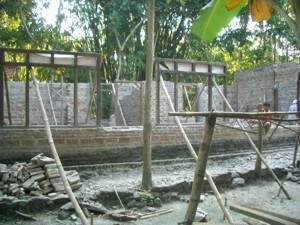 With sufficient donations, the Foundation will build and repair as many such schools as possible. With the Foundation's team of volunteer workers, local price knowledge and negligible administration costs, Donors are assured that the project they donate to is carried out in the most cost-effective manner with every single penny of their contribution going direct to helping those who need it most. Once life has returned to some kind of normality in the earthquake area, the Foundation wishes to be able to provide Library Services to as many villages as possible. At present there are no such libraries and the children have to buy their school books from the school, which many parents are unable to afford. While schools in the west are adding the latest computer facilities, the children of the villages in Java are sharing old text books and trying to save space in their writing books. The Foundation will provide the necessary school books as well as information and learning books for adults through village libraries. In most cases the Heads of the villages can help with premises. Either they have access to a vacant property which can be used for the purpose, or free land which can be built on. The Foundation will carry out whatever refurbishment or building work is necessary, supply the books, provide training to and employ a librarian. Each library will also be supplied with at least one computer with the hope that eventually computer training can be offered from the library.